When I first started making yogurt I used a cooler to keep the yogurt warm enough to incubate. Yogurt is pretty forgiving, but for GAPS and SCD we want to use up all the lactose in the milk so the temperature needs to be kept at an even 100 degrees for a full 24 hours. The Excalibur dehydrator has a temperature setting that can easily hold this temperature for you. With the trays pulled out, you can fit literally gallons of yogurt in the dehydrator at one time! Yogurt starter. The Specific Carbohydrate Diet requires a yogurt starter with only acidophilus, on the GAPS diet plain high quality yogurt from the health food store can be used as the starter. In a stock pot, heat milk gently on medium heat, stirring approximately every 10 minutes, until milk is close to a boil. Cover, remove from burner, and allow to cool until the yogurt is comfortable to the touch, 90-110* F.
Make sure the yogurt is not too hot at this stage, or you will kill the good bacteria that are going to make your yogurt into milk. Place yogurt starter in the warm milk and whisk or stir to distribute evenly. Pour milk with starter into the glass jars, if you’re using quart sized jars, they do fit in the 5-tray dehydrator you just have to tilt them to get them in there. Cover, and shake to distribute culture even more. 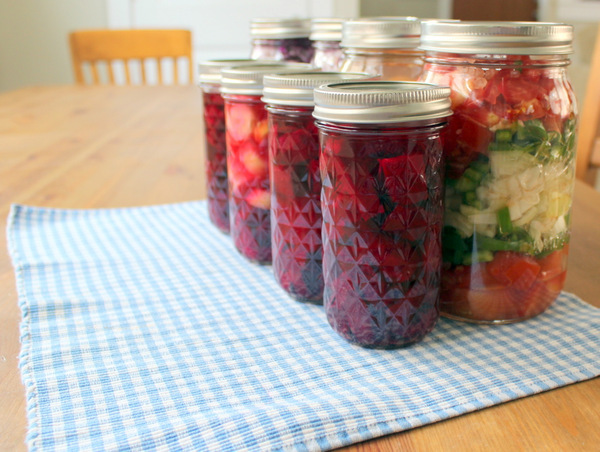 Place covered jars in the dehydrator, and turn to 100 degrees for a full 24 hours. Yogurt is now done and should be kept in the refrigerator. Do you miss the grab-and-go yogurt cups from the grocery store? It’s so simple to just pour your milk mixture into small individual size jars before incubating! Then just stack them in the dehydrator. We have both 4 ounce and 8 ounce jars for this purpose- so cute! These, and any size jar (I’ve done half gallons sideways in the dehydrator too) all take 24 hours. Whenever you’re concerned about immune function, whether it’s during the winter when sickness is going around or during any stressful time, add just a few dried elderberries to your finished yogurt, the whey in the yogurt will plump them up a little and they’ll turn the yogurt a pretty pink! Raw yogurt (not heated above 115 degrees)- I have never had success with this! If you have, can you leave tips in the comments? Heating the milk on the stove isn’t the same as industrially pasteurizing it, it heats slowly so it doesn’t change the protein structure. Though it does lose the enzymes and friendly bacteria found in raw milk. If curds and whey do form, that’s okay, save the curds as yogurt cheese and the whey for your cultured veggies. Another way to make yogurt cheese is with a coffee filter. Do you make yogurt? I love to! It’s a great way to save money too, with the cost of the finished yogurt being virtually just what you paid for milk! Yogurt cultured for 24 hours at 100 degrees has used up most of the lactose, making it suitable for the GAPS and SCD diets. Yogurt starter. The Specific Carbohydrate Diet requires a yogurt starter with only acidophilus on the GAPS diet plain high quality yogurt from the health food store can be used as the starter. Pour milk with starter into the glass jars, if you're using quart sized jars, they do fit in the 5-tray dehydrator you just have to tilt them to get them in there. Hi there, I culture raw milk and it seems to work, every now and then I do an ‘pasteurized’ batch and freeze in ice cube trays for yogurt starter (1cube = 1TBSP) doesn’t seem to work when the starter is raw. 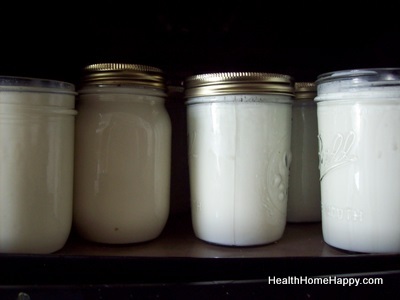 Homemade yogurt is fab and cheap especially when on a dairy farm!! I make raw yoghurt. It is a different texture but works fine. I find it depends a lot on which starter i use as to the texture. The one we use at the moment tends to separate a bit but another one was quite gloopy and worked especially well with raw sheeps milk. One time i used pasteurised milk and my daughter didn’t like it as she is used to the texture of the raw (it was the same milk but the farmer ran out of raw). Thanks for your post! Super informative. I just started GAPS and bought a 9 tray excalibur Dehydrator to learn the dial only goes as low as 105, however I’ve heard the actual temperature range can go as low as 85. I’m a little confused. I’ve looked at a lot of blogs including yours and everyone seems to have the same model but they say they heat their yogurt at 100 or 95 in the dehydrator. The ones that have settings that low are digital and double the cost. I’m wondering if you happen to have any answers? From what I understand as long as the yogurt is not incubated at over 110 degrees F then it is okay. I think just turning the dial to 105 degrees should work well. we make yogurt with raw goat milk in our excalibur regularly! mine separates into curds and whey when it gets too hot. we don’t add lids, and set the temp to 98 (i’ve read and agree that excaliburs seem to run a little hot). works great for us! Success with your recipe! My first attempt to make GAPS yogurt (crockpot method) was a failure, so I purchased a food dehydrator. This recipe worked perfectly, and I now have a beautiful line-up of yogurt-filled glass jars in my fridge. My family of 5 is slowly building up our tolerance for it. We all love it with a drizzle of regional honey and some blueberries. So glad to hear Teresa! Can I reuse pasta mason jars and lids in Excalibur dehydrator for yogurt? Do I need new lids? Do you put lids on during the 24 hour period? I use only raw milk and never heat it. I just mix in the starter, plain organic yogurt with as many bacteria strains as I can find, sometimes combining two kinds, then place it in my oven with the light on for 24 hours. It works well.